In 2012, Grandeur of the Seas underwent the Royal Advantage. More than a revitalization program, the Royal Advatage seeks to enhance the ships in the Royal Caribbean fleet by bringing popular elements of Royal's giant Oasis class ships to the rest of the fleet. For Grandeur, one of six Vision class ships in the Royal fleet, the Royal Advantage was transformative. Hotel Director Francois Wache was part of the team that brought Grandeur into service in 1996. In the years that followed, he worked on many other Royal Caribbean ships including Legend of the Seas, the Radiance class ships, the launch of Oasis of the Seas and the development of Quantum of the Seas. As a result, he did not return to Grandeur until after she had gone through the Royal Advantage. Prior to the Royal Advantage, the food offerings on Grandeur were essentially limited to the main dining room and the buffet restaurant, the Windjammer. After the program, Grandeur boasts three specialty restaurants: Chops Grille, an elegant American-style steakhouse; Giovanni's Table, a relaxed but upscale Italian-themed venue; and Izumi, an Asian-inspired resturant. In addition, Grandeur offers the Chef's Table experience in which a chef and a sommelier guide a small group of guests through a multi-course meal with wine pairings. Also, taking the place of the small Solarium Cafe, is the more extensive Park Cafe where guests can have complimentary made to order salads, paninis, and various other items by the Solarium pool. To that end, the ship's central atrium, the Centrum, was radically altered. Prior to the Royal Advantage, this space was dominated by a large mobile sculpture that hung from the ceiling. A few events were held in the Centrum but the lobby at the base of the atrium was multi-tiered and did not lend itself to entertainment. Also in the lobby is a new bar, the R Bar. Here, guests can order traditional cocktails, develop their own cocktail or have a new creation developed especially for them. Speaking of lounges, Grandeur received two specialty lounges during the Royal Advantage. The Concierge Lounge was carved out of the Viking Crown area at the top of the ship and thus offers panoramic views. Access is limited to guests staying in certain suites and to the top levels of the Royal Caribbean loyalty program, the Crown and Anchor Society. Along the same lines, the Diamond Lounge is limited to guests who are Diamond level and above in the Crown and Anchor Society. It overlooks the stern and is located within the ship's secondary entertainment venue, the South Pacific Lounge. 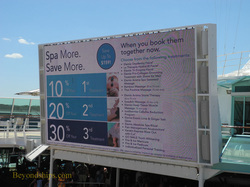 Another new entertainment offering is the big outdoor LED screen by the main pool. This To allows Grandeur to offer movies under the stars as well as various other types of video programming. Yet another element of the transformation was the revitalization of the staterooms. “By the end of the day, the stateroom represents the largest chunk of the space onboard. A significant amount of the time that the guests spend onboard [is in the staterooms].” To make this time more enjoyable, Royal replaced the televisions with flat screen TVs and redid the bathrooms. Carpets and other fabrics were also renewed. While the Royal Advantage has enhanced the cruise experience on Grandeur, it is only an ingredient in what makes up the cruise experience on Grandeur.